It’s been longer than I wanted it to be since my last visit to Gertrude’s at the BMA. By the way, for those not sure, BMA is the Baltimore Museum of Art. I don’t want to take anything for granted. This old reliable reliable restaurant, and by old I mean it’s been around since 1998, and in the restaurant business that’s a long run, is a Baltimore delight. Gertrude’s is open Tuesday through Sunday for lunch and dinner and serving brunch on the weekends from 10 a.m. to 3 p.m. There’s seating for 120 inside and another 80 outside. By outside I’m talking about under a huge tent which is available year round. 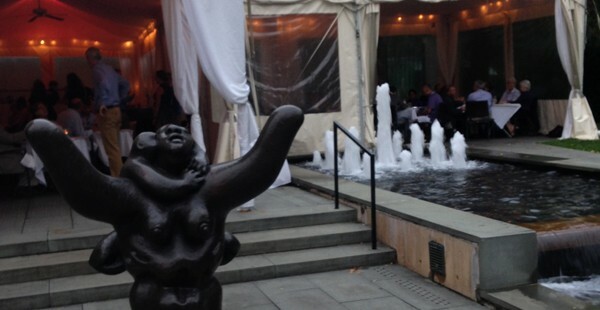 During the warmer months it’s great fun to dine in the Sculpture Garden. I have done that before and on a warm summer night, it’s hard to find another comparable spot. Well okay maybe a veranda in St Thomas overlooking the Caribbean. But believe me, Gertrude’s is closer. The dress was described to me is as you feel when leaving the house. The decor is a bit of elegance without being stuffy. Music is provided Friday and Saturday night and the Sunday Brunch. Some folks like to eat at the bar, which sometimes has available seating when the main dining room is full. One of the partners, John Gilligan, told me the favorite menu items are the crab cakes, of course, and on Tuesday nights the Maryland pan fried chicken. I had the rockfish on my last visit and it was delicious. The other partner is John Shields, also famous for his cookbooks on Maryland cuisine, especially the seafood. His new book is Chesapeake Bay Cooking the 25th anniversary. The name of the restaurant is derived from two sources. Firstly, John Shields grandmother was named Gertrude and secondly, it was named for writer Gertrude Stein, who encouraged the Cone sisters to bring their celebrated art work to the Museum of Art. Parking is available on the museum lot or on Art Museum Drive. You can reach Gertrude’s at 410-889-3399 or by going to gertrudesbaltimore.com. One final thought, when there ask for either John. They love to chat with their customers.